In pre-Islamic era, concepts of diyat was present in Arabic society. In pre-Islamic period, diyat was considered blood money and this blood money and this blood money was, in fact, a kind of fine. And such fine was paid by a killer or his family or his clan to family or clan of victim and it was paid in the form of goods or animals. However, Islam changed this old concept of diyat and decided that diyat should be paid in cash. Section 299(e), 323, 308, 312, 319, 320, 322, 338(c), 330, 331, of P.P.C. 1860. 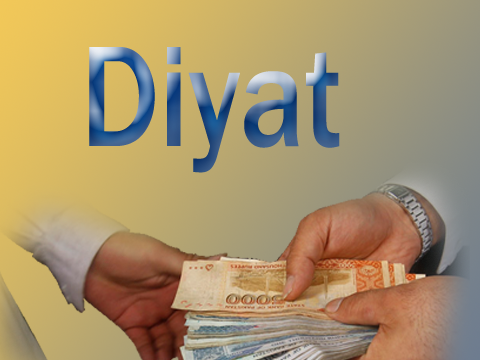 In Arabic language, diyat means blood money and ransom. And it legally means compensation, which is granted to heirs of victim by an offender. It means that Diyat is some pecuniary value which is given in Section 323. (i) The Court shall, subject to the injunctions of Islam as laid down in the Holy Quran and Sunnah and keeping in view the financial position of the convict and the heirs of the victim, fix the value of Diyat which shall not be less than the value of thirty thousand six hundred and thirty grams of silver. (ii) For the purpose of sub-section (1) the Federal Government shall by notification in the official Gazette, declare the value of silver on the first day of july each year or on such date as it may deem fit, which shall be the value payable during a financial year. Thus according to this section diyat is not to be less than the value of 30630 grams of silver. This amount shall be revised and declared every year through the official gazettle issued on the 1st July by the Federal Government. First principle is that court should fix amount of diyat according to Quranic injunctions. Second principle is that court should not fix amount of diyat less the value of thirty thousand, six hundred and thirty grams of silver. Third principle is that court should keep in view financial position of both the offender and heirs of victim to fix amount of diyat. Fourth principle is that court can though enhance amount of diyat, yet it cannot reduce such amount according to Holy Quran and Sunnah. Under Pakistan Penal Code, diyat should be disbursed among heirs of a victim according to their respective shares in inheritance. However, if a heir foregoes his/her share, diyat cannot be recovered to extend of his/her share. To conclude, it can be stated that Holy Quran specifies retaliation through principle of Qisas, but prescribes that one should seek compensation and not demand retribution. It reveals that Holy Quran not only explains concept of Qisas, but also explains concept of diyat.